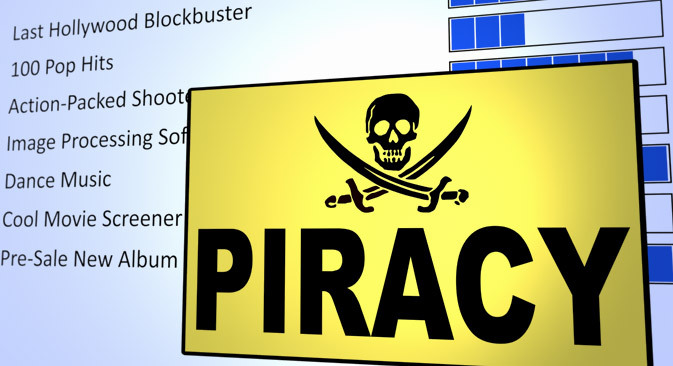 A music streaming resource faces shutdown on charges of pirating music tracks. The portal TracksFlow has become the first Russian Internet resource to be blocked by a court ruling for unlawful use of music content. The website’s owner, Boris Golikov, lost a lawsuit filed by S.B.A. Music Publishing and was ordered to pay 1.55 million rubles ($44,000) in damages to the plaintiff, the copyright holder for songs performed by pop singer MakSim. The case was substantiated by official letters from Sony Music and Warner Music. The Moscow Court of Arbitration additionally ruled that the website would be shut down, barring a victory on appeal. Despite its reputation, Russia is not the primary country from which most pirated media is downloaded. According to the monitoring service Musicmetric, in the first six months of 2012, Russia was in 24th in the list of countries actively downloading pirated music content with the use of the Bit.Torrent protocol. The top three places on that rating belonged to the United States, the UK and Italy. According to the Musicmetric survey, in the first half of 2012 Russians downloaded 22.7 million music tracks; users in the UK, nearly 347 million; and Americans, 775 million tracks. The website does not allow for tracks to be downloaded. "As soon as I get the materials of the case, I'll file an appeal and will try to explain how TracksFlow works. I am sure it will clarify things," Golikov added. Yegor Yakovlev, the founder and managing director of the video portal Tvigle.ru, disagreed with Golikov’s position, saying that copyright infringement cannot be justified by saying that the website is an aggregator. "Imagine that you launch a TV channel that carries Channel One, HBO, CBS and TNT signals, since they are all free to air, and you play the same content. Why does it seem unacceptable on TV but not on the Internet? All talk of quoting is absurd," Yakovlev said. Physically, the website http://tracksflow.com/ is based in Russia, on http://selectel.ru/ servers, and will be blocked in a matter of 24 hours, as prescribed by the Russian laws. "Usually, in cases like these the server is blocked within 24 hours after we receive the official relevant notification from the court (information from media is not enough for that). Although, Selectel has not received any notifications regarding the website TracksFlow so far," said Vasily Borisov, head of the company's marketing department. "Generally speaking, since the domain belongs to an American company, it is possible that after it is blocked on our server, it may move to a foreign server. It is very likely. This is what owners of Internet sources that may be blocked for copyright infringement do in 99 percent of cases," Borisov added. "This is the first ruling of this kind in Russia and it comes after the introduction of the new anti-piracy legislation nicknamed 'Russian SOPA' in 2013. The legislation is aimed at tackling the growing problem of file-sharing and streaming sites springing up in Russia," said Arkady Bukh, partner at Bukh Law Firm. "This is where the case gets interesting. TracksFlow.com is registered under the American company known as Name.com. The easiest way to execute termination of the domain name would be for its founder to hand it over. This is however highly unlikely in light of Golikov's determination to fight the Arbitration Court's decision against his music sharing site, more so for his claim that he was never notified of the lawsuit against TracksFlow in the first instance. The Moscow Arbitration Court has confirmed that he has 90 days within which his appeal can be brought against its decisions," Bukh added. Bukh believes that it is doubtful that this ruling will be upheld in the U.S. The goal of the antipiracy law adopted in Russia last year is to improve the country's reputation as a haven for pirated media. According to the Communications Ministry, since the law came into force, the number of people in Russia who choose to pay for legal content has increased by 30 percent. Since then, there have been a number of high-profile criminal cases against suspected Internet pirates, including against the co-owner of the torrent tracker website Piratebay, Gottfrid Svartholm. However, those were cases against specific individuals rather than Internet resources, making the case against TracksFlow the first of its kind.